It could be the start of a new era at Metro. On Wednesday, WMATA showed off a full-scale mockup of one of its new 7000-series rail cars, the biggest visual upgrade since the system opened in the late 1970s. Out: worn-down carpet, old orange seats -- and even the previously updated blue and maroon ones. In: more glass, blue seats, and electronic panels that display the names of the stops the train is approaching. 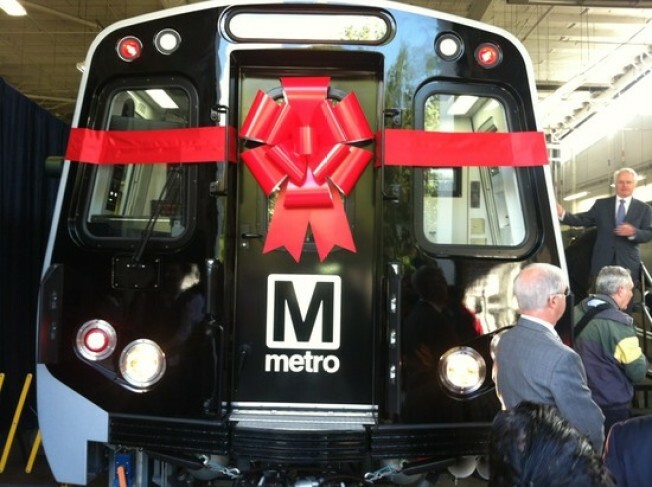 "The new car is airy, more contemporary, more relaxing, more inviting," said Barbara Richardson, Metro's assistant general manager. You're not only supposed to get a better look and feel, but these new rail cars are expected to improve reliability and safety. The bodies are made of steel, able to better withstand an impact if an accident does happen. "It's the 21st-century car for Washington Metro," said Metro general manager Richard Sarles as he stood in front of the model car at a Metro facility in Landover, Md. When the new cars arrive in mid-2014, the oldest rail cars in the Metro fleet -- the 1000-series cars -- will begin their retirement. It was 1000-series cars involved in 2009's deadly Red Line crash that killed eight passengers and a train driver. Passengers riding in the new train cars, which cost about $2 million each, will see both subtle and obvious changes. The new cars will have security cameras and more bars for customers to grab. The new seats have no arm rests, which means wider aisles. And the floors are a black non-slip vinyl with specks of red, white and blue. The signs are better, too. Four screens can display videos, transit information and possibly ads. Two more LED signs show the current and upcoming stations. That means customers no longer must look out the train's windows to try to spot the station name. Riders said Wednesday that they would welcome some changes. "The carpet has gum and goo on it," said riders Nicole Turner. "And sometimes on the Metro, there's graffiti on the seats." I'm quite sure that me and all the other Metro passengers would agree that [new cars] would be a great improvement," said rider Tanya Briscoe. Thelma Murray-Fisher, 65, who has been traveling on Metro since it opened, said she'd appreciate more space to hold on during busy rush-hour times. Tim Wood, a professor at The George Washington University, said the electronic signs would be especially helpful for tourists who are always trying to get to the Smithsonian stop. Sofia Castillo, 30, a law student at American University, said a replacement for the often-stained carpet made sense to her. Production of the cars is expected to begin this winter in Nebraska.